Recent DirecTV commercials clown its cable competitors for coming up short. Folk on social media have taken that concept and created a meme about presidential candidate Dr. Ben Carson and his wife, Lacena, aka Candy, that has been making its way around Facebook, Instagram and Twitter. The meme includes an image of President and Mrs. Obama in elegant formal attire at the recent China state dinner. The president is dressed in a well-tailored tux and the first lady is stunning in an off-the-shoulder, custom-made Vera Wang gown; her make-up is impeccable, as is her long, side-swept hairstyle. The picture on the other side of the meme is of the Carsons, taken on the day that he officially announced his candidacy for president in Detroit. He is dressed in an average looking blue suit. 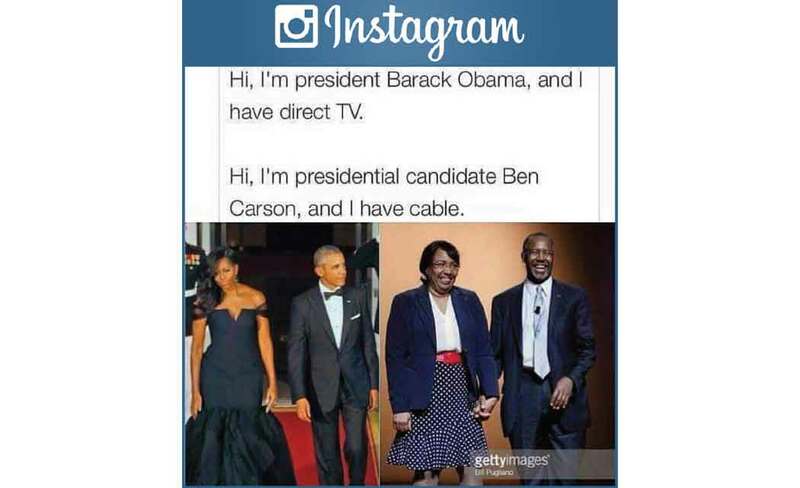 It’s Candy Carson’s appearance that has folk on social media talking. Some say that she’s fair game because she agreed to be in the spotlight when she stepped into the public with Carson. Others say that spouses should be off limits and that any focus on her should be on her substance, not her style. President Obama made it clear where he stands when it comes to presidential candidates’ spouses coming under fire.